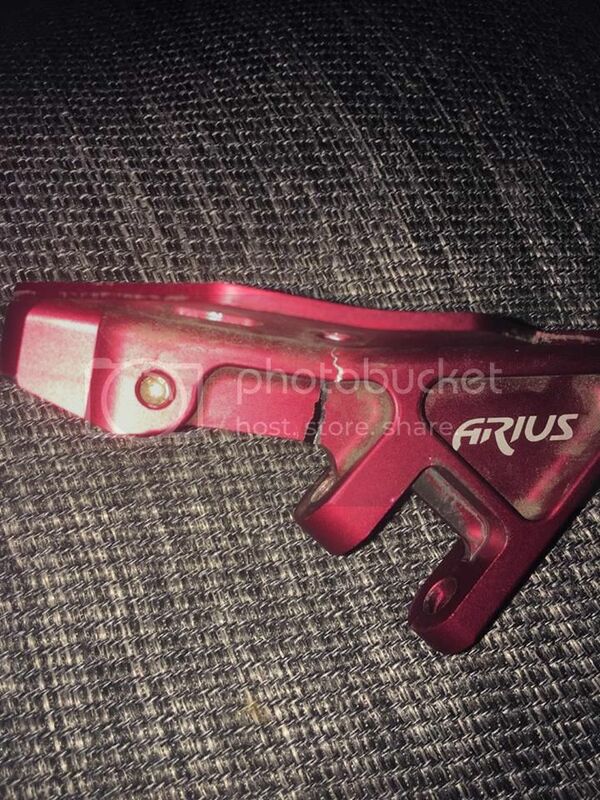 Just looking for some advice or experiences from anyone who has tried to fix their Arius after it failed in the common place at the toe. It failed just out of warranty so I'm struggling to have it replaced and desperately need a working plate for the weekend. Is it in 2 pieces? I havent done it, but you COULD try to cut/dremel out the break line a little. Apply JB weld and bend it back flat. Once cured, sand down the areas, to bare aluminum, and jb weld the crap out of the area where it needs reinforcement. Just be careful where your applying it so it wont interfere with the plates normal functions. Not quite, just bent and torn at the usual place between the toe and the truck. i would get it fixed under warranty. take it back to the shop you got it at. It's not an option they have given me, just a discount on the Platinums where the known problem has allegedly been fixed. eh....i would mail them back to riedell customer service, and thank them for the defective plate and great customer service. I have fixed a couple of sets, but I am in Australia. If the original design and material strength were inadequate, one would not expect to rely on welding to fix it in any way that would be likely to prevent a repeat performance. Welding aluminum will normally weaken the base metal surrounding the wekd zone. So, how much good is that likely to accomplish for you, long term? The plate design was faulty the day it went into production, and the manufacturer needs to acknowledge that by replacing it (or both). Weld looks fine, should skate just fine, but I woukd try to lay down some more material to partially emulate the newer platinum version if possible. Maybe even weld down a piece of flat bar alu where the mounting hardware goes, to thicken that part of the plate as well, which would reinforce the too thin beam area. I build up and remachine the area to strengthen the problem bit. No point in repairing the problem if you aren't improving it whilst there. Spoken like a true gearhead. While you can weld up an area, it can leave stressed spots and crevices. Actually removing material strengthens things when done correctly to improve the surface smoothness. Remanufacturing a plate that has failed because it was poorly engineered from the get go by the the manufacturer does not make a lot of sense to me. #1 → It could fail again, and you could be severely injured, but have no recourse with suing the manufacturer for the cost of your injuries. #2 → Unless the company/person repairing the plate will assume liability for the repairs, why do them? #3 → The repair will look rather ugly unless you spend enough to match what buying a single new plate (hopefully at some discount) would cost. #4 → You should let Riedell Powerdyle know that this SLF thread will continue being updated regularly until fair resolution of your problem has been implemented by them. Last edited by Armadillo; October 5th, 2016 at 05:44 AM. #3 → The repair will look rather ugly unless you spens enough to match what buying a single new plate (hopefully at some discount) would cost. #4 → You should let Riedell Powerdyle know that this SLF thread will continue being updated regularly until fair resolution of your problem has been implementsd by them. Unless you can also fix your own broken bones, possibly resulting from a 2nd failure, subtract logical analysis points. Speaking as one who has felt the pain of hitting the asphalt hard because I expected metal parts to handle forces that they were not capable of handling reliably → It ain't worth it to be gambling on stuff like this. What makes you think anyone is assuming liability in the first place? If you read the OP you'd know that the plate failed out of the warranty time period. I presume you fell because a skating element failed. Kingpins break all the time from use. Show me an axis pin failure. O.- Though Axis pins are known to come lose. :P I always notice mine the 2 times they have come loose before the truck fell off. 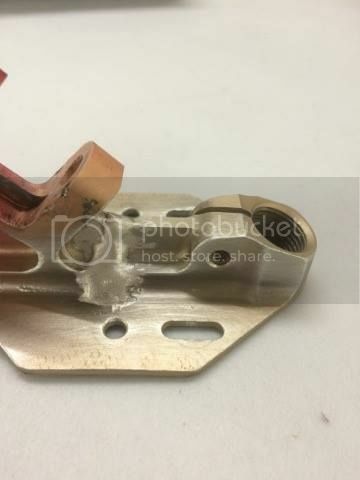 I would lay down some mroe Alu weld in there and machine the area welded smooth, get some pictures of the platinum, also you could add some beads to the stress line across the mounting fins too. from the under side of course, this will keep the top of the plate to boot area the same while further stifening the original crease line. ... and this is why we get someone we trust to repair the item. Knowledge of forces involved helps lots when effecting a repair/improvement. As too liability, it is not what I think about whether this version of the Arius plate was not adequately engineered & fabricated to the have the strength level needed to properly handle the peak stress levels of derby duty, it is what the lawyers, judge and jury think. Car companies routinely pay or settle lawsuits for manufacturing defects and failures in the millions & millions of dollars, despite the cars being out of warranty when the issues became apparent. Manufacturers remain accountable for non-abusive failures that can be attributed to flaws in design and fabrication of their products. All the emails of Reidell-Powerdyne since even before the Arius was first sold can be subpoenaed to see what engineers were thinking when these kind of failures were first observed. Head of engineering can be grilled on the witness stand as to why plate was redesigned and whether specific improvements were because of design flaws. 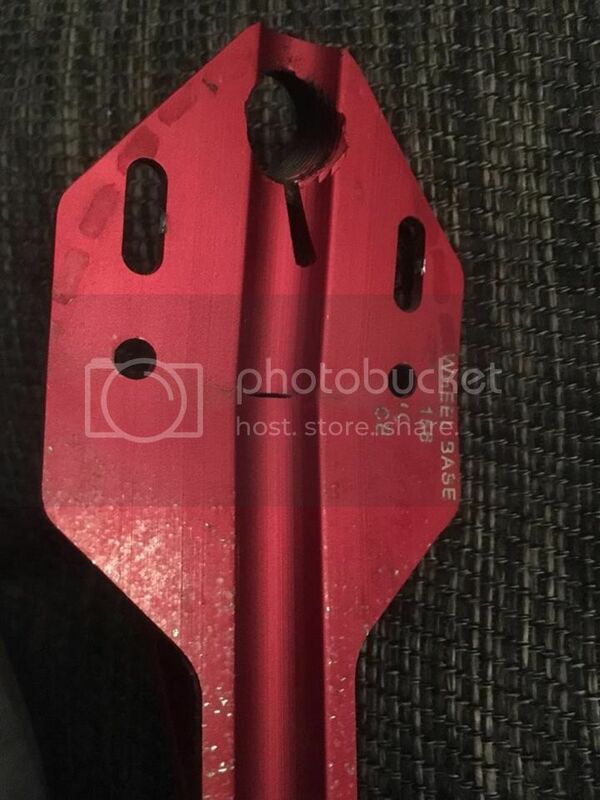 When a plate fails like this it is in significant numbers, it is usually an indication that the alloy metal was too low strength and/or the section area at point of failure was too small or insufficiently reinforced. Using welding to remedy such insufficiencies is a dubious strategy at best. It is not about whether "Failure can happen anywhere anytime to anything," it is about the % of failures and what level the number reaches before a factory recall might be indicated. Liability for materials and workmanship is always IMPLIED, whether or not accountable party wants to be liable, they can still be dragged into court and subject to the results of the legal system as to the determination of their liability. It is not "pretty easy" to remove metal from convex pockets without proper tooling and cutters, and it may not even make cost effective sense to pay someone else any significant amount of $ to do this with a plate whose durability over time is already suspect. As a do it yourself project with learning potential, sure go ahead and see how it turns out. My fall was from a kingpin snapping. It was too weak of an aluminum alloy (2024) for the the 3/8-16 thread's cross section area, and incremental crack propagation starting at the V-notch at root of thread did it in. When metal bends far enough to CRACK AND SEPARATE, as in the PICs, this is considered a BROKEN plate, even though it hasn't fallen apart into two pieces (yet!). No matter whether it is a kingpin or the plate that deforms and cracks, if that failure prevents proper function, then same result → useless skate until the failed component is replaced or repaired. bare plates being most expensive items means attempts to fix them are more likely, but still not necessarily sensible. Yea Richard, using a dremel is hard. This is a skate plate, not a piston for a F1 car. The responses here in this thread seem a bit odd comming from you, considering the way you glue things together. One could easily "glue" a flat piece of steel , alu, brass, or what have you to the plates mounting fins up front, floor side, with a thin layer of JB weld. Then flip it over and drill the hole for mounting hardware. The plate was not specifically targeted to derby skaters, not guarenteed or advertised for its strength in that regard . Theres plenty of users who have not broken toestop sections of the plate as well. I would bet that almost all breaks have been from abusing toestop use found in derby. It would be extremwly easy to shoot holes all in a lawsuit case with even a public defenders help. Use some common sense and logical reasoning. To sue for derby play that is causing these failures would be a near equivelant of a driver in Demolishion Derby suing a manufacturer because a ball joint failed, or an upper control arm broke after having a large impact. Look how many vehicle manufacturers have been sued because a failure happened while a vehicle was being abused, like racing. This is the reality. If you disagree, make a thread and discuss the failure potential of the plates and why a lawsuit would be viable. This thread isnt about the liability of the equipment, its about fixing it. Yea Richard, using a Dremel is hard? This is a skate plate, not a piston for a F1 car. Hard when you don't have one or know how to choose the proper cutting tip that will not clog up immediately with melting aluminum clogging its cutting surface. The responses here in this thread seem a bit odd coming from you, considering the way you glue things together. 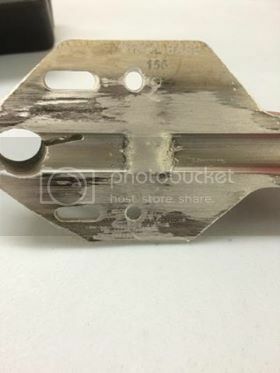 One could easily "glue" a flat piece of steel , alu, brass, or what have you to the plates mounting fins up front, floor side, with a thin layer of JB weld. Then flip it over and drill the hole for mounting hardware. Makes more sense to me than just welding does. The plate was not specifically targeted to derby skaters, not guaranteed or advertised for its strength in that regard . There's plenty of users who have not broken toestop sections of the plate as well. Lacking a "Warning Sticker" that states → "These skates are NOT INTENDED FOR ROLLER DERBY SERVICE" → the lawyers will eat them for lunch. I would bet that almost all breaks have been from abusing toestop use found in derby. It would be extremely easy to shoot holes all in a lawsuit case with even a public defenders help. Use some common sense and logical reasoning. Many plates will NEVER FAIL adjacent to the toe stop -- no mater to what level of "abuse" they are exposed. As a mater fact, a truly good plate design should be such that the plate is always STRONGER than the toestop stem, such that the toestop ALWAYS FAILS FIRST → NOT the plate! To sue for derby play that is causing these failures would be a near equivalent of a driver in Demolishion Derby suing a manufacturer because a ball joint failed, or an upper control arm broke after having a large impact. See above → If some better designed (heavier/stronger) plates can tolerate this level of punishment then, lacking an Arius plate warning sticker saying "Do not use these plates for Roller Derby" exposes the manufacturer to lawsuits. This thread isn't about the liability of the equipment, its about fixing it. This thread is about whatever the responding posters offer in their replies. The goal of the OP is to end up with a plate that works instead of a broken one, and hopefully hot having to purchase a new one at retail price. Many ways that that can happen. This is reality → many plates will NEVER fail this way, thus Arius flawed design is prime suspect. You are making as many questionable assertions as I, but at least I back mine up with something logical. Declaring excess abuse as the defacto cause of this failure is a rather bogus assertion at best. You can go start a thread defining what "excessive abuse" actually means, and be sure to also explain why some plates can still handle it without failing, but Arius CAN'T! Last edited by Armadillo; October 6th, 2016 at 09:44 AM.